Buying a backpacking cookset is a great way to get the backpacking cookware you need all in one package. 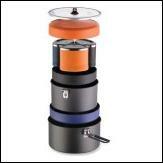 They are typically designed so that the items can nest inside one main unit – normally your pot. This is an efficient and really cool way to allow your cookware to pack compactly. There are many different cookset options available and come with a wide variety of cookware. Some cooksets are simply a pot set that come with a few different pots and pans that nest for easy and compact storage. Others are designed to include plates, utensils, cups, bowls, etc. Before you purchase, make a list of what items you need. If you’re not sure what you need, visit our backpacking cookware page. There we discuss the basic cookware items you’ll want to have. As you’ll find, the options for what you can have are nearly endless, so making a list will help you narrow down what you’re looking for. Once you make a list, stick to it. As we mentioned above, the variety of items you can find in a cookset are quite diverse. Avoid buying a cookset that has more than you need because in the end it will just cost more money and you’ll end up with cookware that you don’t use or adds unnecessary weight to your pack. Personally, we pieced most of our cookware together and avoided buying a cookset simply because most came with far more than we need or want to have. For some though, a cookset is an ideal way to acquire your cookware.